Description: Every summer the Atrium Gallery is transformed into an art and science lab with creative hands-on displays exploring water science – the water cycle, water flow, rain, runoff, watershed and point source/non-point source pollution. 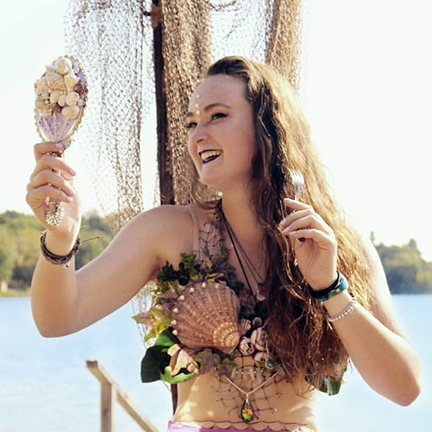 This interactive environment is a project of Just Add Water, a program developed by Hudson artist Liz Malanaphy to educate young people about water and inspire them to make connections. The Just Add Water Art & Science Lab will be the classroom space for several art and nature Summer Art Camp classes and, when classes are not in session, the Lab will be open for the public to use on a “drop-in” basis. Description: St. Croix RiverFest Deluxe River Exploration is an amazing week for students who love the St. Croix River, science and art. 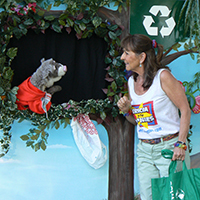 Work with experts in the environmental field, participate in RiverFest programs, paddle a kayak and, using trash from the river to transform the RiverFest mascot. Scrappy, a 15-foot sculpture of a splashing bass, will be displayed at RiverFest events. For ages 8-14. Bring a sack lunch each day. The class fee is $119 (including kayak rental). For registration call 715-386-2305 or visit Deluxe River Exploration on the Phipps Center’s website. Description: The river clean-up is a core activity of the Hudson RiverFest. Community volunteers get out on the river bank collecting trash and working to help clean-up the river (bags and gloves are provided). While the goal of RiverFest is to get people out to enjoy the river, the river clean-up is the “purpose” for the celebration. Meet at the Bandshell for the Lakefront Park for the park area clean-up. For more information contact Buck Malick at 715-386-7010 or cmalick2@gmail.com. View instructions for the River Clean-ups. Following the clean-up, RiverFest will host a picnic lunch for the clean-up volunteers at Picnic Point (south end of Lakefront Park). View a map of clean-up locations. 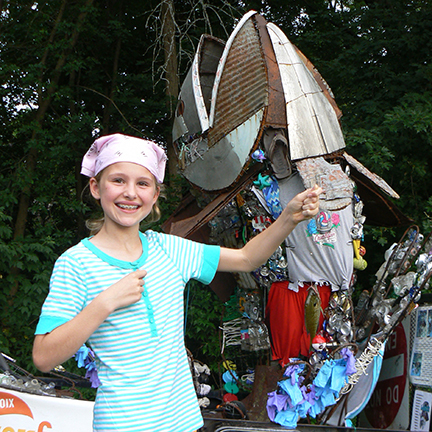 Description: You are invited to watch as students from The Phipps’ Deluxe River Exploration art and science class work to transform the trash collected during the river clean-up to create a new “skin” for “Scrappy,” the splashing bass mascot of RiverFest. Description: River themed stories, songs, crafts and activities. Description: Pop-up Art + Nature activities on the Art Bench Trail are hands-on opportunities for all ages to learn about nature and be creative. Pop-up Art + Nature activities were developed through a partnership of The Phipps and Belwin Conservancy in Afton, Minnesota. 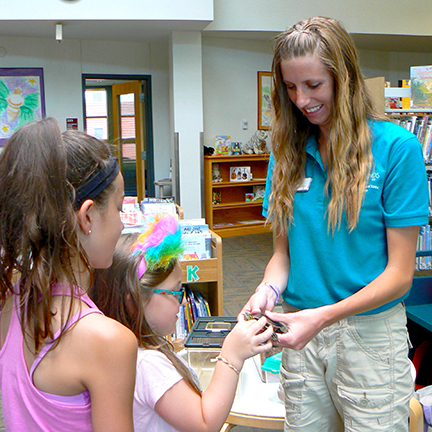 D escription: Join Carpenter Nature Center (CNC) staff to learn about the wildlife of the St. Croix River Valley and meet live animal ambassadors, including frogs, turtles, snakes and a bird of prey. Find out what you can do to help protect the river valley ecosystem and the amazing animals that live in the Valley. CNC is an environmental education facility with the goal of fostering appreciation and inspiring stewardship of the natural world. 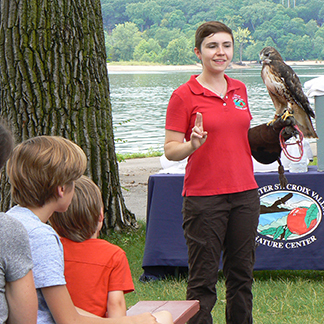 With campuses on both the Minnesota and Wisconsin sides of the St. Croix River, CNC is able to preserve wildlife habitat while also providing quality educational opportunities. Description: The Toonies will bring together viewers of all ages in environmental awareness, teamwork and fun. Learn about the many ways of reducing the amount of trash we generate — rethink, reuse, recycle! Please note: in the event of rain, the concert will be moved to the Hudson Area Library at 700 1st Street. 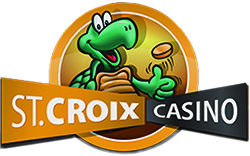 Description: A naturalist from Willow River State Park will introduce children to animals from the St. Croix River. Please register with the library. Description: Come to breath, move and re-energize your body through a simple series of basic postures, guided by Kishori from Ciranda. We will meet behind the bandshell, facing the beautiful St. Croix river as our inspirational landscape. Come 5 – 10 minutes early to sign up and to settle in to the surroundings. Bring your own mat. All levels welcome. Required: comfy clothes, a curious spirit and a sense of humor! Description: Join Missy Sparrow, a prairie plant specialist form the Wisconsin DNR, and Jennifer Vieth, Carpenter Nature Center’s director, for an evening hike through the prairie. We’ll be looking for blooming forbs and grasses as well as listening a looking for birds. Field guides and binoculars will be available to use, or you may bring your own if you have them. This is a FREE, event but space is limited, and reservations required at 651-437-4359. Description: Stop by the St. Croix Sailing School Open House for brief sailing clinics and information about the school. Time: 6 – 8:15 p.m. Description: RiverFest partner organizations will have booths with information and demonstrations before and during the concert. Time: 7 – 8:15 p.m. 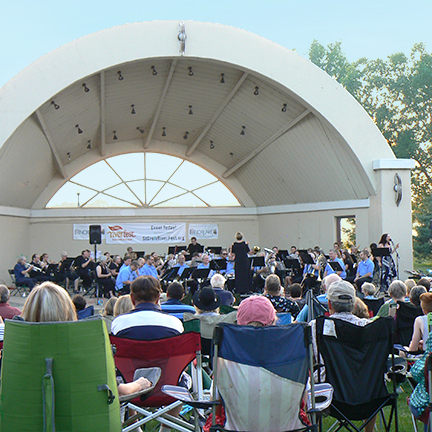 Description: RiverFest Musical Extravaganza features the St. Croix Valley Community Band along with the Metro Brass. The RiverFest Concert will include selections that reflect 50 years of celebrating our “Wild and Scenic River.” Directors Kris Tjornehoj and Christopher Tank will lead the SCVCB in this special performance. You won’t want to miss this fun-filled family evening! 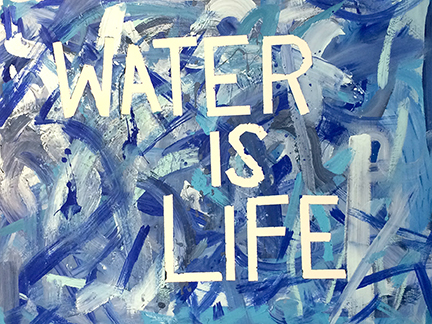 Concert attendees will be invited to visit the Water is Life booth and help create a painted mural. See the RiverFest mascot Scrappy on display! 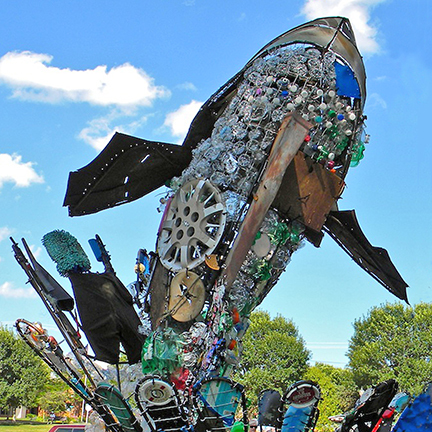 Created by sculptor Mary Johnson, the splashing bass figure is metal armature. 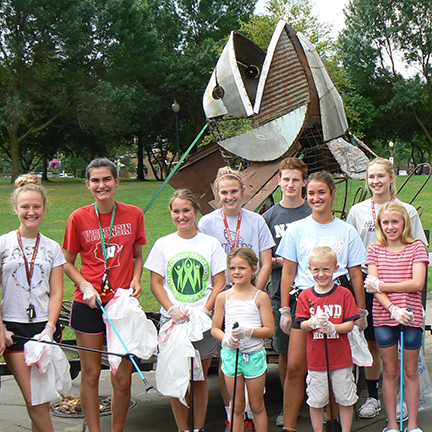 Each year students from the Phipps Center for the Arts “Just Add Water” art and science class help complete the sculpture by processing and re-purposing the litter collected in Hudson during the river cleanup to create a new “skin” for Scrappy. Description: The Carpenter Nature Center will be present their birds of prey raptor show in the lobby of the library. Observe live raptors, learn about their similarities and differences, and hear about adaptations a bird of prey has to help it survive. Time: 6:30 – 8:45 p.m. – Boarding at 6 p.m., Departs at 6:30 p.m. SHARP! Description: Explore the St. Croix River Valley with Carpenter St. Croix Valley Nature Center Naturlists. Learn about the natural history of the area and meet a few live animal ambassadors from Carpenter Nature Center. Come aboard the Grand Duchess for a beautiful sun set cruise. St. Croix RiverFest tickets will be seated on the 2nd level. Binoculars will be available to use for bird watching or you may bring your own if you have them. 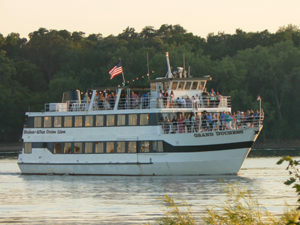 Details on St. Croix River Cruises’ website at www.StCroixRiverCruises.com or call 651-436-8883. RiverFest Cruise: $18 plus tax for Carpenter Nature Center presentation and cruise only (no dinner). Cash bar available (no credit cards or checks accepted on the boat). RiverFest Cruise and Dinner: $37.95 for Carpenter Nature Center presentation, cruise and dinner. Cash bar available (no credit cards or checks accepted on the boat). Location: Lake Mallalieu, southwest bay, west of 2nd Street, across from Corky’s Pier, up North Street to Bridge Street. Description: Sponsored by the St. Croix County Sportsman’s Alliance, Hudson Rod, Gun and Archery Club and other partners, the derby is for children ages 6-12. Mentors, bait and fishing poles will be provided. There are prizes for all. Led by Buck Malick. Description: Echo tells of life along the St. Croix River between Prescott and Hudson with a photo opportunity to follow. Time: 10 – 4:15 p.m. 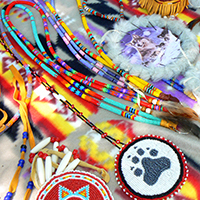 Description: Gather by the river for a Native American Cultural Celebration. 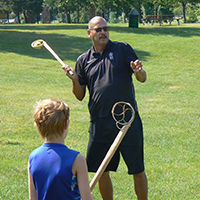 View a printable flyer on the lacrosse & other traditional games. Learn about this hands-on art project during RiverFest. Presented by James Knutson-Kolodzne, St. Cloud, MN, Director of the American Indian Center at St. Cloud State University and enrolled member of the Little River Band of Ottawa Indians, Manistee, MI. Woodland Sky performs historical and traditional stories that give audiences a visual feast for the eyes as well as memorable songs for the soul. 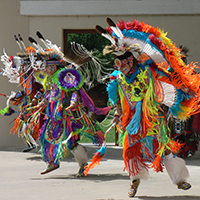 Dancers in full regalia will perform different dance styles including the eagle dance and hoop dance. An onstage narrator will entertain audiences with stories rooted in cultural values and well-seasoned with humor. Woodland Sky is made up of award-winning singers and dancers that span multiple generations making their performance a perfect family event. 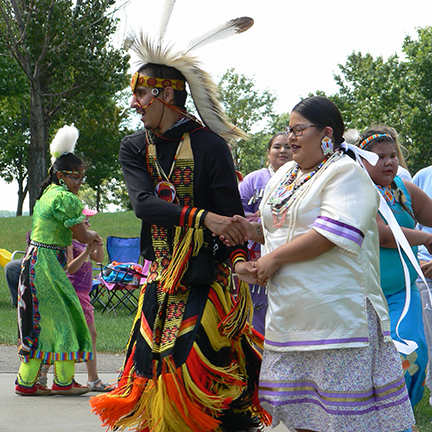 Singers and dancers in Woodland Sky proudly represent the following tribal nations; Ojibwe, Menominee, Potawatomi, Lakota and Apache. Scrappy: See RiverFest mascot Scrappy dressed in is new “skin” made from trash collected during the St. Croix River Cleanup. 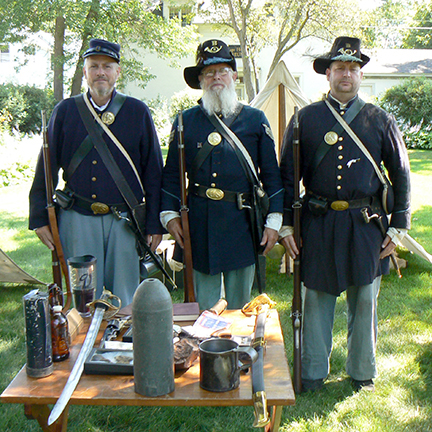 Description: Local Civil War re-enactors will stage an encampment on the lawn of the Octagon House Museum. Re-enactors from the Prescott Guards will share stories of the everyday life of the Civil War soldier. Enjoy an old-fashioned Ice Cream Social fundraiser with baked goods, sundaes and floats with demonstration of hand-churned ice cream and samples.